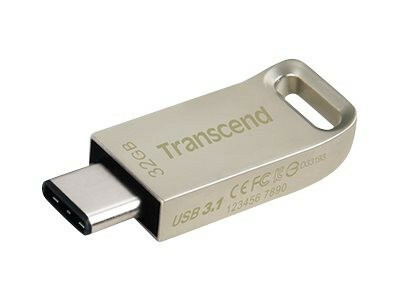 Transcend's Jet­Flash 850 flash drive utilizes the next-generation Type-C connector with USB OTG (On-The-Go) technology for use with devices featuring USB Type-C ports. The device sports an ergonomic curve grip design. With a free download of Transcend Elite software for PCs and application for mobile devices included, you can more easily manage and back up files stored on the JetFlash 850. Transcend's Jet­Flash 850 comes with the latest USB Type-C connector for greater ease of use. It is reversibly-oriented and compatible with next-generation devices, such as smartphones, tablets and computers. Equipped with the SuperSpeed USB 3.1 Gen 1 interface, the JetFlash 850 delivers transfer speeds of up to 130MB/s, meaning lightning-fast access to your data. Transcend's Jet­Flash 850 effortlessly expands the storage space of your devices by providing up to 64GB capacity. The JetFlash 850 is also an ideal option for students and business professionals needing to store presentation slides, schoolwork, and business documents. Transcend's Jet­Flash 850 features an ergonomic design, with a slightly curved grip for easier, more natural user experience. A lanyard hole is provided for attaching the device to your suitcase or bags, making the JetFlash 850 readily accessible while still looking trendy. A cap is included to protect the USB connector from being accidentally broken. Using innovative COB (Chip on Board) technology and assembled with a metallic casing, the JetFlash 850 is completely resistant to dust and splash while remaining lightweight. Tablet or mobile phone with a USB Type-C connector and support for USB OTG host function.